Amalaki Rasayana is ayurvedic classical medicine used for rejuvenation, aphrodisiac, immunomodulatory and antioxidant properties. It is beneficial for brain, eyes, heart, liver, skin and hair. It improves the functions and health of these organs. It mainly has antioxidant action and Vitamin C content, which fights against free radicals and reduces the signs of ageing. This action is likely to be responsible for its rejuvenating property. It reduces a headache, blurred vision, burning sensation in eyes, eye fatigue, eyestrain, irritated eyes, dizziness, double vision, etc. It is also effective for gastritis, peptic ulcer, inflammatory bowel disease (IBD), hepatitis, skin problems, hair fall, and several other health problems. Amalaki Rasayana has three types of formulations. Amla Swaras (Amla Juice) Q.S. In this method, Amla Churna (Amalaki Powder) is mixed in Amla Juice and ground in a mortar with a pestle for 21 days and then left to dry in the shade. Then, the powder is prepared and preserved in food-grade plastic or glass containers. Amla Churna is mixed in Amla Juice and left to dry in shade. It should be better to grind it in a mortar with pestle. When the powder is completely dried, then mix following ingredients. Mix all ingredients in Ceramic Jar and keep it in ash heap for 4 months before the starting of the rainy season. After 4 months, remove it from ash heap and then use it as Rasayana or medicine. Note: For Amalaki Rasayana 1, there is no appropriate adjuvant is described and generally, it is recommended with either water or milk. We have advised water as a safest adjuvant. In some cases, Amla with milk can worsen the symptoms in patients suffering from joint pains or arthritis. This preparation is also called Amalaki Pippali Rasayana. Mix Amla Churna and Pippali Churna in Ceramic mortar. Then add Amla Juice in it and then left to dry in the shade for 7 days. The difference in Amalaki Rasayana 1 and others is that Amalaki Rasayana 2 and 3 are also acting on spleen and liver. Amalaki Rasayana 2 and 3 have potent hepatoprotective and spleno-protective actions. These two formulations can significantly reduce the size liver in hepatomegaly and the size of the spleen in splenomegaly. These two also treat ascites (increased fluid in the peritoneal cavity) and reduces the fluid in the peritoneal cavity significantly. Amalaki Rasayana 2 contains honey in its formulation, so it may not be suitable for diabetic patients. However, Amalaki Rasayana 1 and 3 can also be used by diabetic patients along with Cow’s ghee or water. These two have antihyperglycemic and anti-diabetic actions, so these formulations can help to keep the blood sugar levels under good control. 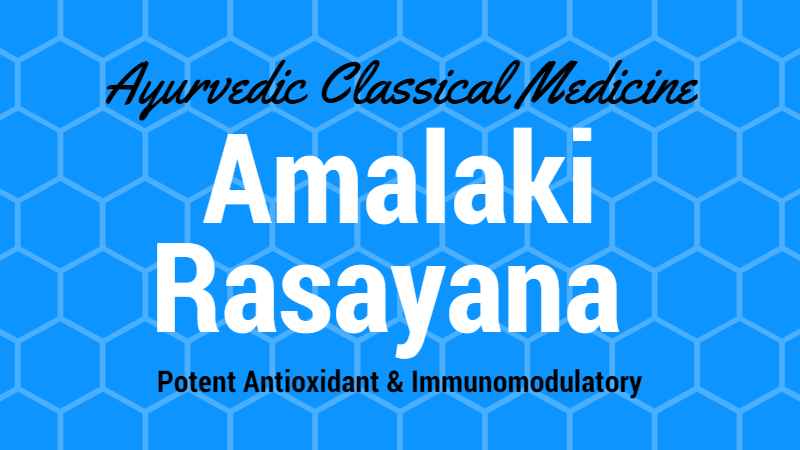 Amalaki Rasayana has potent rejuvenating action. It prevents premature aging and nourishes the skin and hair. It is a potent immunomodulator, which helps to improve non-specific immunity and prevents common viral and bacterial infections. It also has Cardioprotective action, which improves the heart functions and strengthens the heart musculature. Amalaki Rasayana is generally used for eyes and it prevents almost all eye diseases. Amalaki Rasayana is rich in Vitamin C and bioflavonoids that exert potent antioxidant action. It helps keep the eyes healthy. It is important to take Vitamin C along with flavonoids especially from the natural source for maximum absorption and usability of Vitamin C. Amalaki Rasayana an excellent natural source of Vitamin C. It helps to maintain and form collagen found in the cornea of the eyes. The regular consumption helps to reduce the risk of a cataract, vision loss, and macular degeneration. It is used for the treatment of eye fatigue, eye strain, irritation in the eyes, blurred vision, burning sensation in the eyes and several other eye conditions in which Pitta and Kapha Dosha are dominant. Amalaki Rasayana is used to reduce the symptoms of gastritis and acid reflux. Generally, it is used in combination with Yashtimadhu (Licorice). The combination reduces acidic irritation to the gastric mucosa and balances acid secretions. It also improves liver functions, which are generally deteriorated in such cases. It also improves appetite and digestion. Amalaki Rasayana along with Yashtimadhu (Mulethi), Vanshlochan and Praval Pishti heals the peptic ulcers and reduces gastric irritation and stomach pain. However, Amalaki Rasayana is likely safe and well-tolerated in most individuals. Amalaki Rasayana does not have any side effects when taken under professional supervision. Arthritis: Amalaki Rasayana 1 has cooling action in the body, which means it reduces heat in the body. Therefore, when Amalaki Rasayana 1 is used in winters, it may worsen the joint pains in patients with Arthritis. For arthritic people, the first formulation of it may not be suitable. In these cases, Amalaki Rasayana 3 (also contains Pippali) should be more suitable and well-tolerated. Heart Diseases: In cases of heart diseases, the dosage of Amalaki Rasayana should be less than 1 gram twice daily. If it is taken more than 2 grams per day, it can increase heart rate. Heart patients should use it in low doses, but for a longer duration for maximum health benefits. Can I take Amalaki Rasayana with Milk? The best adjuvants for Amalaki Rasayana are water, cow’s ghee, and honey. Amla is considered as an exception for sour and milk wrong food combinations. Therefore, it can also be taken with milk unless you are not suffering from joint pains, arthritis or any Vata disorder. Which is better for eye disease – Amla Rasayana or amla Churna? Both are good for eyes. The difference is Amla Rasayana is processed in Amla juice, which is likely to be more useful and effective than Amla churna. Which is helpful from above three? For stop hair loss and maintain hair density and health. what is QS in the recipe? thanks. QS stands for “Quantity Sufficient”. The small amount of Amla Juice is added, so that Amla Powder get dipped in the juice.